In popular culture, paleontologists are like Indiana Jones. Rugged men wandering through rocky deserts, wearing wide-brimmed leather hats and multi-pocketed khaki vests. Rock-hammers hang nonchalantly from their belt-loops, maps and note-pads protrude from pockets. On a whim, they brush aside some sand to reveal a ferocious skull and massive vertebrae, and then they puzzle out the mysteries of dinosaurs just by staring at the rocks. But in contemporary science, paleontologists are biologists, computer programmers, and engineers. Paleontologists are utilizing technologies from engineering and medicine to enrich our understanding of dinosaurs. Computed tomography (CT) scanners and movement-modeling software allow the skeletons to speak, unearthing much more than just the shape and size of their bones. CT scanners are like huge x-ray machines, but they take thousands of thin, vertical x-ray slices through an object. A computer program uses those slices to re-create a 3-D image in a computer. Paleontologists are especially interested in the braincase ­­— the bones of the skull that surround and protect the brain ­­— because it can provide hints about the dinosaur brain that once lay within. Paleontologists can build a 3-D braincase in the computer by first CT scanning a dinosaur skull, and then selecting just the braincase in each of the thousands of CT image slices. “Animals differ in how closely that endocast, a cast of the inside of the skull, reflects the structure of the brain,” says Witmer. The endocasts of mammals and birds closely resemble their brains, while the endocasts of reptiles are a less-exact mold. By studying the endocasts of dinosaurs’ two closest living relatives ­­­— birds and crocodillians — paleontologists can interpret the endocasts of dinosaurs. “We can actually get a surprising rich amount of information on the sensory capabilities and the cognitive abilities,” says Witmer. Balanoff and her colleagues at the museum used a CT scanner to investigate the skull of Alioramus, a tyrannosaurid dinosaur from the late Cretaceous, between 65 and 70 million years ago. Their research, published in PLoS One in 2011, revealed that Alioramus, like other tyrannosaurids, had large olfactory bulbs. “They probably had a really heightened sense of smell,” Balanoff says. “They’re predators, so it’s not really that surprising.” Though paleontologists are cautious about inferring behavioral traits from fossil, a keen sense of smell could have helped predators like Alioramus hunt their prey. But paleontologists can infer more than cognitive abilities or sense of smell. In other dinosaurs, large optic lobes might indicate a nocturnal animal. Similarly, ear structure can lend information about hearing and balance. Once a fossil is in the computer, endocasts are only the beginning. Various types of engineering and biomechanical software can be applied to the virtual bones, allowing paleontologists to discover how dinosaurs might have moved. Karl Bates, a biomechanics specialist at the University of Liverpool, is using computer software to model the bite force of T. rex. His results, published in Biology Letters in 2012, show that T. rex had an incredibly high bite force of about 35,000 to 57,000 Newtons (N). Bates and his research partner used a laser scanner to create a 3-D model of the T. rex skull inside the computer, and then created a simplified reconstruction of the various jaw muscles. 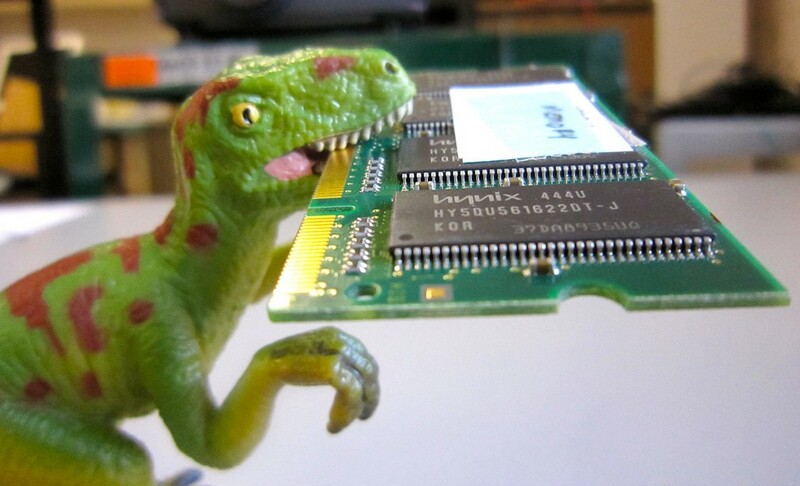 By telling the computer program to fire the jaw muscles together, Bates could estimate the dinosaur’s bite force. Even when compared to other large, predatory dinosaurs like Allosaurus, T. rex’s bite force was far greater. To help verify the accuracy of these bite-force software models, paleontologists often examine how well their predictive models compare with the bite forces of living animals. Gregory Erickson, a paleobiologist and biomechanics expert at Florida State University, studies the bite forces of crocodiles and alligators. His recent work, published in PLoS One in 2012, revealed that the salt-water crocodile, Crocodylus porosus, has the highest recorded bite force of any living animal, chomping down with a force of 16,414 N. Erickson’s work shows that T. rex could bite down with three and a half times the force of a salt-water crocodile, and had the highest known bite force for any terrestrial animal. Not limiting himself to bite forces, Bates used the same multi-body dynamics software to model how dinosaurs moved. Published in the Journal of Vertebrate Paleontology in 2010, he studied the movement of another tyrannosaurid, Allosaurus. Bates created a simplified skeleton in the computer and then attached connecting lines, representing muscles, from bone to bone. The program then generates random activation pattern and sees how far the dinosaur moves in a given amount of time. The program is run millions of times on a supercomputer, which can take two to three months for even the simplest models. Gradually, the model improves until the most efficient pattern of muscle activation is found, revealing how the dinosaur walked, trotted, or ran. The program can also predict top speed, although with the caveat that we know very little about a dinosaur’s muscle mass, which influences speed. For Allosaurus, the program calculated that the carnivore probably topped out at about 12 meters per second, or about 26 miles per hour. Borrowed from the hospital, CT scanners help paleontologists reanimate dinosaurs, allowing Allosaurus to walk and T. rex to bite within a digital dinosaur world. But paleontologists are also partnering with remote sensing experts, whose tools might even be able to help find fossils. In 2011, researchers from Western Michigan University and Washington University in St. Louis developed a computer program that can predict where fossils might be located in a large landscape. Published in Evolutionary Anthropology in 2011, their research suggests a new use for satellite images of Earth’s surface. After returning from summer fieldwork, Anemone enlisted Charles Emerson, a remote sensing specialist at Western Michigan, and two other colleagues to help create a computer program that can predict fossil localities. The program is called an artificial neural network, a computer network that functions like the human brain. Anemone and his team used satellite imagery to teach the network to recognize certain types of land cover. Using the Great Divide Basin as a test-site, they pointed out marshes, forest, and locations where fossils had been found previously. The network learned to recognize the combinations of infrared and visible light that are typical of each type of land cover. Once it has learned what a fossil locality should look like, the network searches the rest of the satellite imagery for the 10,000 square kilometers of the Great Divide Basin. The network successfully identified locations already known to contain fossils, as well as several new locations. “What we came up with is this wonderful map that is basically predicting the areas in the basin that we should go next year and search,” Anemone says. Although this technology has not yet led to any discoveries, Anemone’s work this coming summer will soon test its merit. Paleontology is an old science. The bones are eased from the ground with the simplest of tools — chisels, hammers, and brushes — and their secrets must be coaxed forth with equal care. “For looking back 150 millions years,” says Witmer, “sometimes it’s pretty amazing that we can do anything.” But by borrowing technological tools from other fields of science, paleontology is reinventing itself. Fossils that we once thought had nothing more to tell are sharing new secrets, surprising us with the information one can glean from a hunk of rock.